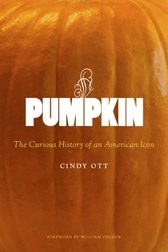 Pumpkin: the Curious History of an American Icon | Fontbonne University Library Reads! The staff of Fontbonne University Library are participating in the Missouri Book Challenge! This blog tracks the books that we've read so far this year. If you’ve ever wondered what the difference is between a pumpkin and a squash, then this is the book for you. With scholarly attention to detail, the author follows this vegetable from the time it was a staple, along with corn and beans, in the Native American diet, through its use to feed the poorest and most rustic peasants and on into functioning as feed for livestock, before coming out as symbolic of autumn and our agrarian roots in a multi-million dollar industry which centers on October 31 (for decorative purposes) and the months of November and December (as pumpkin pie). The pumpkin is “worthless in every quantifiable way”, yet, by its very persistence in our awareness, it proves that “eating is a complex cultural act.” This book is full of fascinating factoids: 95% of canned pumpkin comes from the Libby’s factory in Moreton, Illinois, pumpkin “farms” have become “low tech theme parks” where it is profitable to cover the year-round hog farm with a parking lot for the October pumpkin visitors, and don’t get me started on the pumpkin-growing contests and the festivals! Check it out at Fontbonne University Library!